The wildly clever project of Karolina Cicha and Bart Palyga, 9 Languages, features songs in the minority languages of the Podlasie region of northeast Poland bordering Russia, Lithuania and Belarus: Ukrainian, Lithuanian, Russian, Romani, Belarusian, Yiddish, Polish, Tatar and Esperanto. 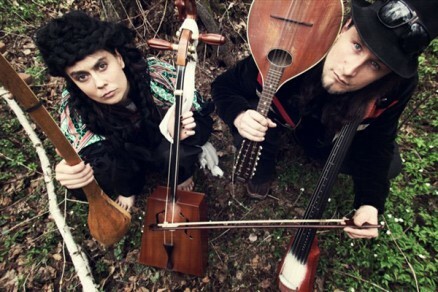 Karolina and Bart perform traditional folk instruments, such as the morin khuur, dotar, Jew’s harp, duduk, accordion and mandolin joined by modern samplers and loopers, as well as ancient overtone singing. 9 Languages was awarded the Grand Prix of the Polish Radio New Tradition Festival and has been performed at the most prestigious folk festivals.